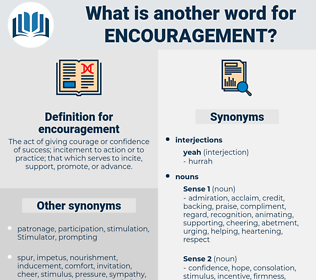 What is another word for encouragement? The act of giving courage or confidence of success; incitement to action or to practice; that which serves to incite, support, promote, or advance. Opportunities, encouraging, encourage, promotion, promotions, incentive, Incentives, stimulus, Promoting, incitement, fostering, encouraged, encourages. inducement, impetus, encouraging, inspiration, enticement, motivation, exhortation, fillip, momentum, furtherance, instigation, enthusiasm, encourage, backing, promotion, breath, comfort, impulse, incentive, excitement, stimulant, stimulus, spur, Promoting, incitement, fostering, assistance, encourages, provocation, reward, suggestion, motivator, invitation, spirit, aid, appreciation. distrust, hindrance, disbelief, impediment, injury, doubt, deterrent, annoyance, hurt, denunciation, derision, gloom. He spoke to Adelaide, and she answered him; but there was no word of encouragement - not a tone of comfort in her voice. Richard caught what seemed to him a glimpse of encouragement in these signs, and observed: " It's not because you object to me, Mr. Blaize?" fostering, instigation, furtherance, vote of confidence, prod, goading, cheering, advancement, provocation, urging, incitement, spur, goad, shouting, spurring, abetment, Abettal, promotion, fosterage, prodding.